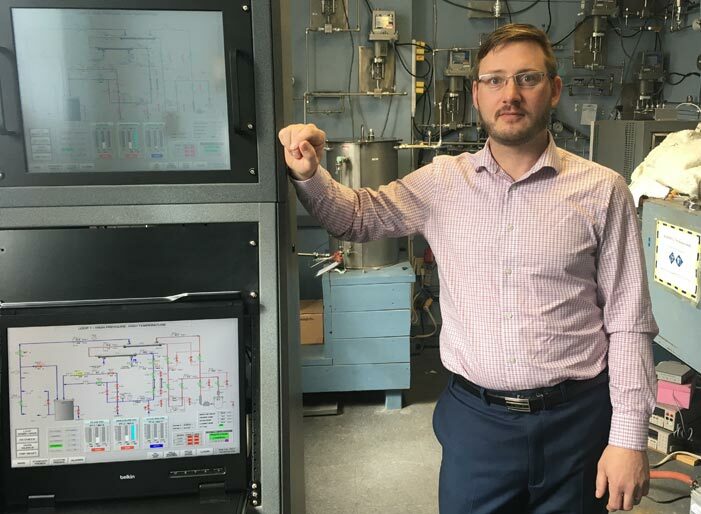 The University of New Brunswick (UNB) and Terrestrial Energy, a vendor of Advanced Reactor power plants, have partnered for integral molten salt reactor (IMSR) validation and verification work. This is part of Terrestrial Energy’s program of regulatory activities required for IMSR power plant deployment. Molten salts are high-temperature ionic fluids with an advantage: nuclear fuel can be dissolved into the fluids, thus improving the safety case over the current generation of reactors since there is zero possibility of a meltdown. Initially, UNB researchers will be precisely measuring the thermal and physical properties of the molten salts that are the heat transfer fluid for the ISMR design. IMSR work at UNB is being managed by Dr. William Cook, professor in chemical engineering and director of the Centre for Nuclear Energy Research at UNB. The CNER is a university research institute with a formal relationship between UNB and Canadian Nuclear Laboratories, Canada’s premier nuclear research organization, which maintains staff on-site at UNB. This relationship helps ensure that CNER can undertake activities that are compliant with nuclear regulatory standards. “We are very pleased with the timing of our engagement with Terrestrial Energy,” said Dr. Cook. “We completed the second phase of R&D work for Super-Critical Water Reactor (SCWR) development for the Generation-IV International Forum (GIF) last year and we are looking forward to focusing on Terrestrial Energy’s integral molten salt reactor, another GIF-recognized reactor system. The University of New Brunswick (UNB) is Canada's oldest English-language university. Founded in 1785, the multi-campus institution has a rich history and a dynamic focus on innovation, experiential learning and entrepreneurship. UNB has nearly 10,500 students from nearly 100 countries while several thousand more take UNB courses online and at partner institutions around the world. UNB contributes significantly to the province with an annual economic impact of $1.2 billion on the provincial economy over the course of one year—equivalent to 4.5 per cent of the gross domestic product of New Brunswick. Terrestrial Energy is developing an Advanced Reactor based on its Integral Molten Salt Reactor (IMSR™) technology. The IMSR™ represents true innovation in safety, cost and functionality. It will offer safe and reliable power solutions for electricity production and energy for industrial process heat generation. These together extend the applicability of nuclear energy far beyond its current footprint. With this profile, the IMSR™ is capable of driving the rapid global decarbonization of the primary energy system by displacing fossil fuel combustion across a broad front. It is complementary to renewable power sources and ideal for distributed power systems on existing grids. Using an innovative design and proven Molten Salt Reactor technology, the IMSR can be brought to global markets in the 2020s. Terrestrial Energy USA Ltd is an affiliate company that is developing IMSR technology for US market deployment.